When you consider the word “branding,” what comes to mind? You may think of well-known companies like Apple or Target, that advertise on a large scale and whose characteristics are immediately recognizable to most of us, who come into frequent contact with them. But the concept of branding is just as important for small businesses as it is for large companies. And, it’s an essential piece of increasing awareness for nonprofits as well. Why Should You Build a Brand? Like any other entity, your nonprofit has a unique set of goals, characteristics, and stories. 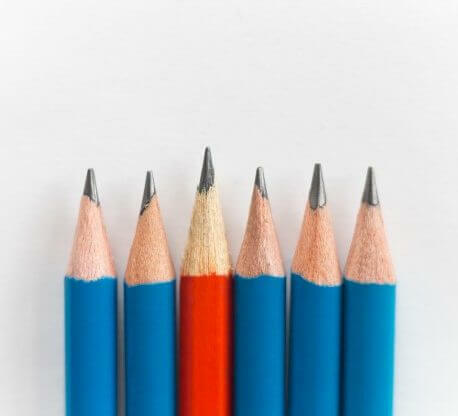 When you bring these together to form a recognizable and repeatable persona, you have a brand. The first thing most people think of when they hear the word brand or branding, is an entity’s logo. While this is one branding element, it’s only the beginning. The style, graphics, and words your organization uses to communicate all convey your brand. But what can branding do for your nonprofit? Creating a brand around your nonprofit allows you to separate yourself from the crowd. There are a lot of nonprofits out there (over 4,000 in VT alone!) and invariably there are other organizations with the same general mission as yours. 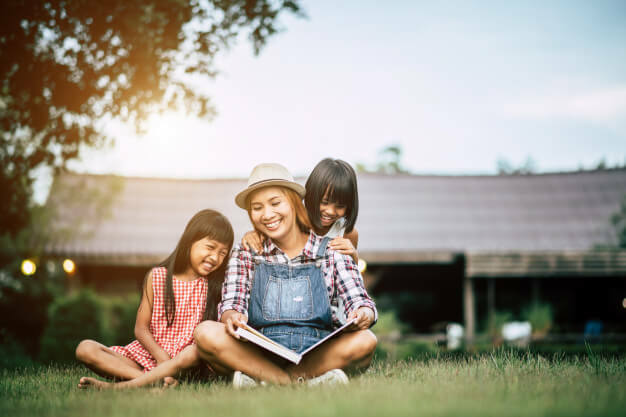 To make a connection with donors and bring precious fundraising dollars your way, you must tell a story that illustrates the unique mission of your nonprofit. Helping donors to understand the specific goals your organization is working to achieve is a critical reason for developing a brand. Branding allows you to project your mission as an indelible piece of your organization. 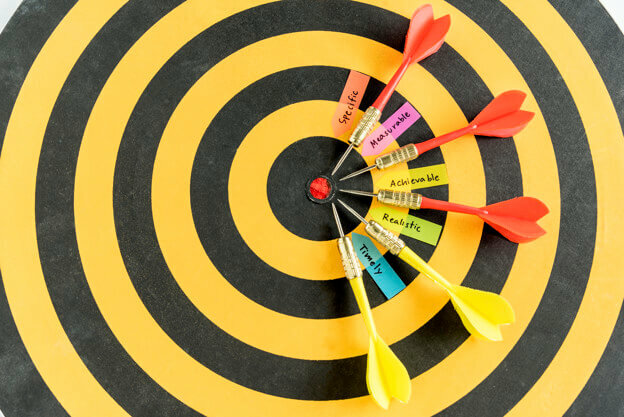 Potential donors can recognize these goals as the core of your brand, helping to reinforce your purpose. Nonprofits follow the same sales and marketing rules as businesses—it’s going to take multiple touches before a potential donor will make a gift. They will have to encounter your organization several times until it becomes familiar to them. Having a brand allows you to create one cohesive image that you can present to the world. The more a potential donor sees that image, the more recognizable you become, and the more likely they are to engage with you. 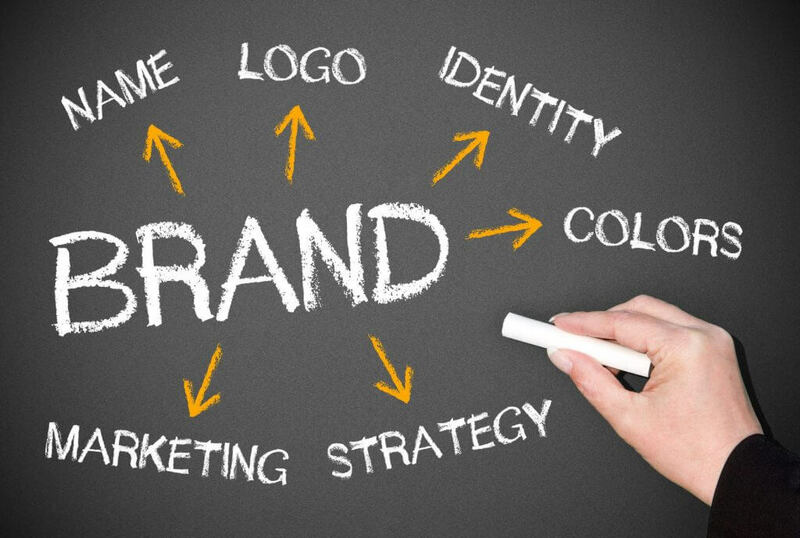 Branding can also give you a professional image, increasing your sense of authority. The Stanford publication referred to branding as a way to reinforce internal identity. While your brand works to become familiar to potential donors, establishing a brand also helps to give your employees, volunteers, and board members something to rally around. They will feel like part of a team, helping to strengthen internal bonds. A key piece of developing a brand is consistency. By constantly presenting your nonprofit using the same language, imagery, and message, you’re helping to build awareness and create a reliable image for your audience. You should update all your marketing and fundraising materials to reflect your branding. Your social media content should echo what a visitor to your website or a recipient of your postcard will see. Consistency helps to establish the notion that you have clear, defined goals, and the experience and authority to achieve them. Consistency can also apply to the frequency of your communications. You may have more activity leading up to an event, but work to stay in regular contact with your audience without being overwhelming. For instance, you could send one mailing per month, rather than several mailings during your campaign period and none the rest of the year. 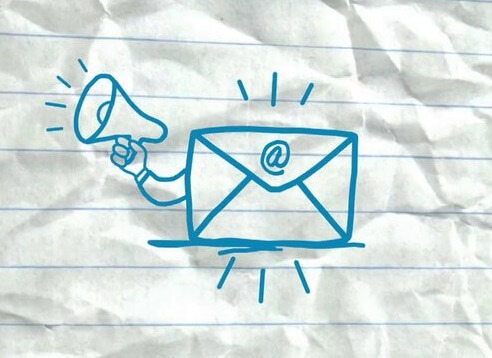 Like many nonprofits, you may be using direct mail for your fundraising campaigns. If so, you know that direct mail is an effective way to spread awareness and increase gifts. In part, this is due to the physical nature of a mail piece in our digitally saturated world. It reflects the power of print to connect with an audience—print boasts a 70% higher recall than digital. In addition to direct mail, do you have other print collateral, such as business cards, brochures, banners/signs, or letterhead? These are all elements that contribute to the building of your brand. Where do you source these from? By collaborating with a single source for all your printing, you can ensure that the donor experience is consistent. Each print piece can be consistent in terms of color, paper stock, and the overall look and feel. Also, when you work closely with a source for something as important as fundraising, that source truly comes to know your organization, and can suggest avenues to explore that will accurately and effectively reflect your organization. Want to talk about building your brand? Paw Print can assist with all your printing, mailing, design and promotional product needs. Contact us today! 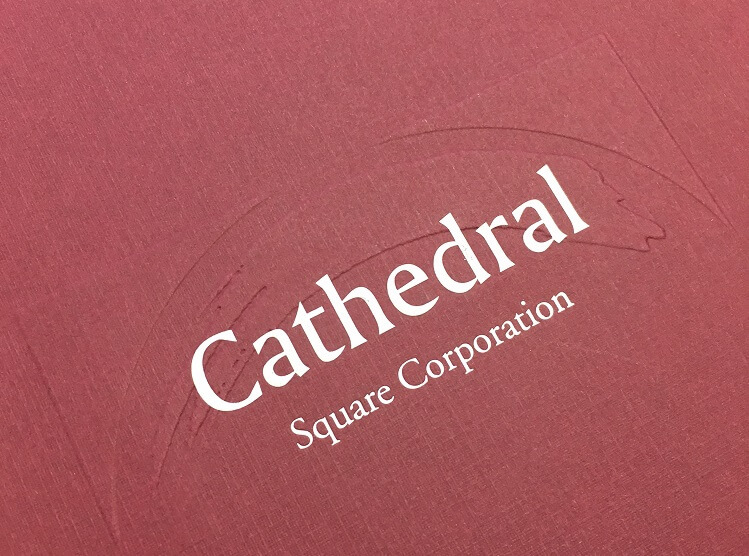 The artwork on this folder was produced using an emboss covered with a red metallic foil. Using foil to decorate printed materials has a long tradition. It ties back to the process of gilding, where items like picture frames or furniture are covered with a layer of gold leaf. Historically, manuscripts and books were also decorated with gold leaf and metallic foils. 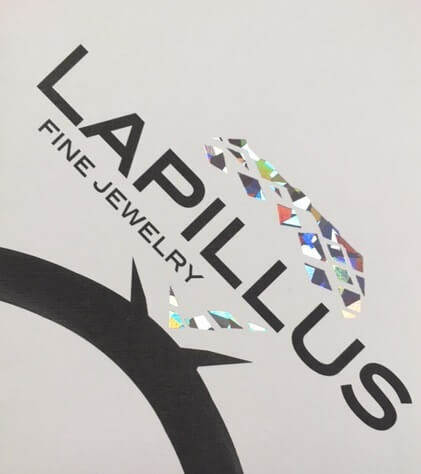 Metallic foils mimic the shine of a diamond on this brochure. Today, decorating with metallic foil is certainly more common than gold leaf. With a range of materials and objects available for foil imprints, you can affordably add a touch of elegance to your promotional materials. The beginning of the process is similar to engraving or debossing. First, a metal die is etched with your design. The die goes into a stamping machine that feeds foil through a set of rollers. Three layers come together: the heated die on one side, foil in the middle, and paper on the other end. In one fluid motion, the die trims the foil to your design, then imprints it into the paper. 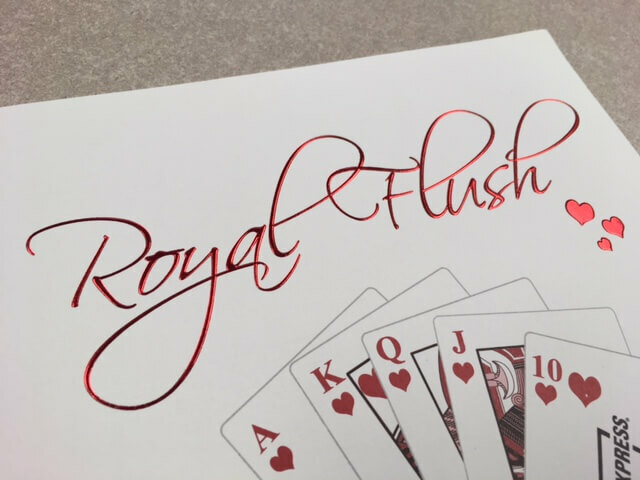 Foil can be applied to the even surface of the paper, or it can be combined with other processes like embossing, where a die raises your design off the paper for a dimensional look. 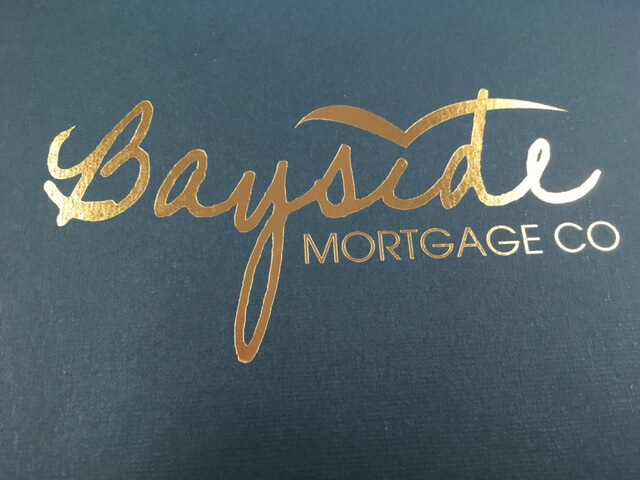 This presentation folder was printed with a gold foil. Business Cards: A business card is often a potential customer’s first point of contact with your business. Adding foil to your design will really wow a recipient. Stationery: Create an eye catching and memorable look for your stationery and envelopes by printing them with foils. Presentation Folders: Whether you’re hosting an event or want to organize your marketing materials into one package, presentation folders are an effective solution. And, they look especially striking when printed with metallic foils. Promotional Materials & Packaging: A touch of foil on a booklet, brochure, gift bag, or custom box adds excitement to your products and offerings. Invitations: Wedding and event invitations are one of the most popular places to use foils. Make your occasion even more special by printing an unforgettable invitation with foil stamping. What’s the impact and benefit of adding foil stamping, embossing, or engraving to your printed image pieces? You’ll instantly make a remarkable and memorable impression. Hand someone a document with any of these finishes and then watch their hands and fingers sweep over the surface, like someone reading braille. This makes your effort “more” than just print. Your print is now making a physical and emotional connection. The power of print. At Paw Print, we offer foil stamped, engraved, embossed and debossed products. Stop in today to explore our samples and foil choices, and see how foil stamping can help your brand make a positive and powerful impression. Embossing gives your printing a unique look and feel. Ribbon vector created by Freepik. 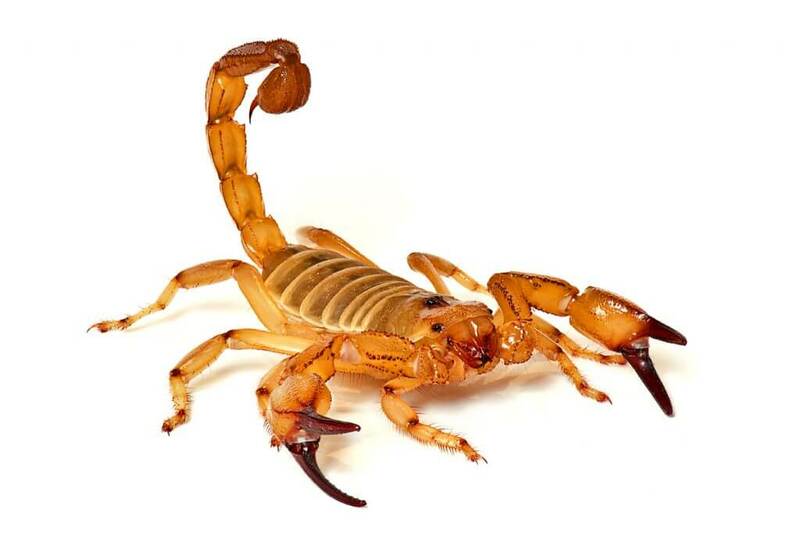 When you think about printing you may be thinking of a printed sheet as a flat, 2D product. But in fact, what makes print such a compelling and effective medium is its physicality. Holding a printed item in your hand, whether it’s a brochure, postcard, or envelope, is shown to increase marketing success. Print boasts a 70% higher recall over digital, is trusted 34% more than digital, and is easier to process—92% of individuals ages 18-23 find it easier to concentrate on and process printed content. Print has power. And when you’re able to get your printing in front of potential lead, you’ve got to make it count. You can make your printing more powerful by using artistic techniques like embossing and debossing. This folder was decorated using both a blind emboss (background image) and a one color emboss (text). Embossing produces a raised, 3D effect on the printed item. It is visible on both sides of the piece: as a raised surface on the front, and an indention on the back side. Two dies, or metal plates, are used, one for the front and one for the back. 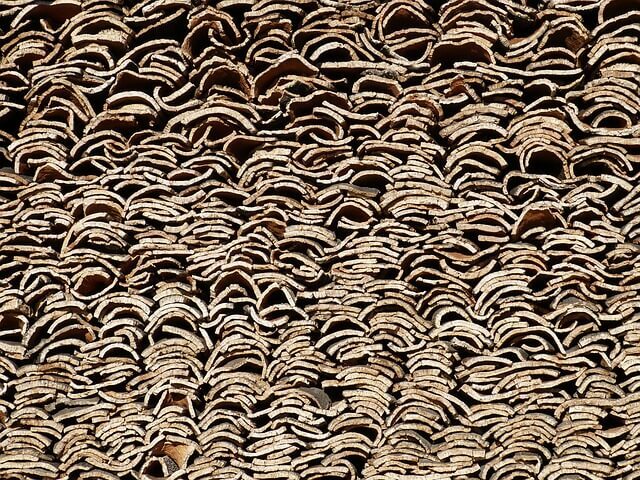 The paper is sandwiched between the plates at high pressure to create the emboss. You can use what is called a “blind emboss” where the raised surface is the same color as the paper. Or, you can apply ink or foils to make the emboss really pop. Consider debossing as the opposite of embossing. Rather than creating a raised surface, debossing uses a die to imprint your logo or image into the surface material, giving an indented or depressed look. 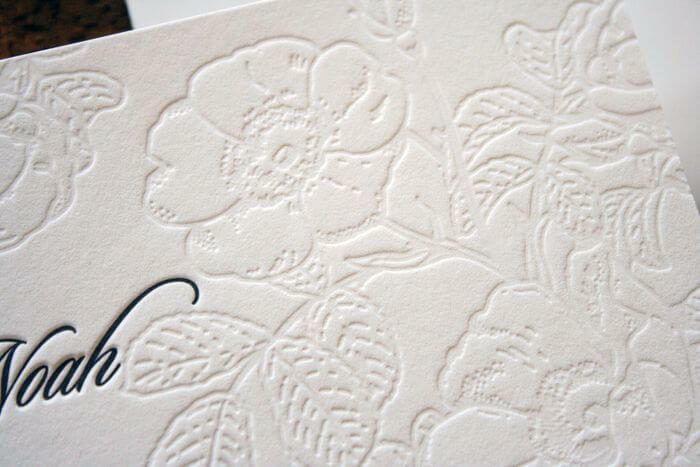 As with embossing, the debossed area can be filled with ink or foil, though a blind deboss is also a common choice. Debossing is able to capture your artwork in fine detail. While both embossing and debossing have been a part of the print industry for many years, you won’t see this method decorating just any product. 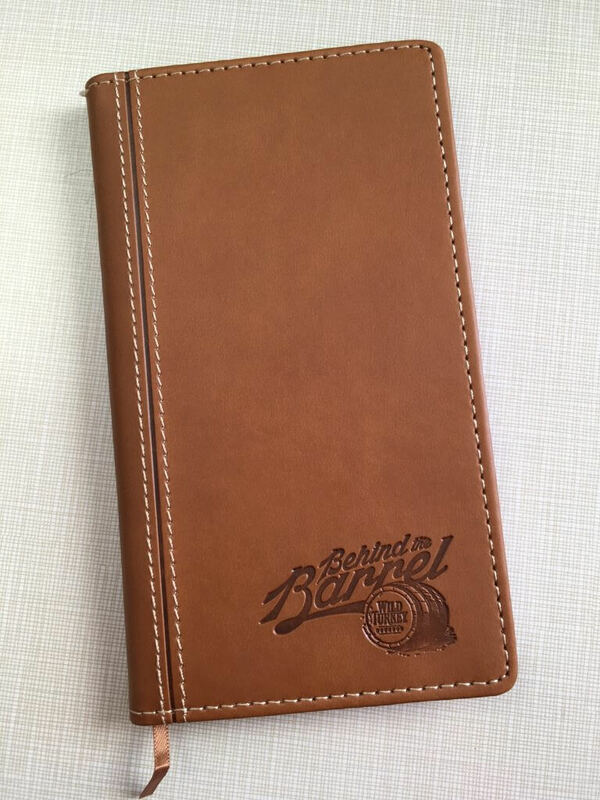 Adding an emboss or deboss to your printing can give your items something extra, that’s sure to get noticed. When you hand someone a business card that’s embossed or debossed, it’s guaranteed that they’ll pause and feel the textures, creating an instant “wow” impression. The same is true when receiving a letter on letterhead that’s embossed/debossed. If you want to make an impression, this method will do it! Leather and faux leather materials are ideal surfaces for debossing. Another area in which debossing has found popularity is with promotional products. Debossing looks impressive on paper. And it’s especially striking on items made of leather, faux leather, or vinyl. Journals, portfolios, and luggage tags are popular items on today’s promotional products market. Imprinting these products with a deboss rather than a screen print will create a very different look. When deciding how to brand promo products, a common question is, how much branding? It’s always important when marketing with promo to know who your audience is and how they will be using your items. What you choose to imprint and how you do so are big pieces of that decision. Often, branding is most effective when it is subtle. A potential customer may not want to use a journal with your logo imprinted in bold colors across the front. If they are just starting to work with your company, they probably aren’t ready for that level of brand engagement. This is where a deboss can be the perfect solution. Blind debossing can create a more sophisticated look without being flashy. 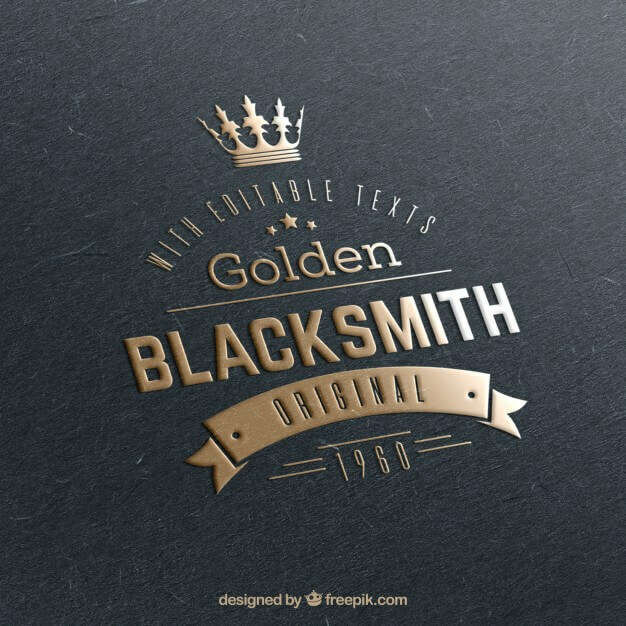 A smaller, debossed logo may be more impressive to a potential client than a large printed one. And, if they are more excited about the item, they’re more likely to start using it. At Paw Print, we offer embossed, debossed, engraved, and foil stamped products. 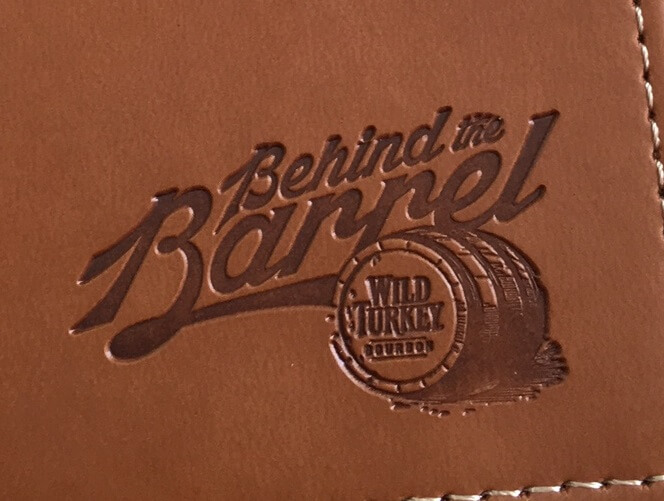 Stop in today to explore our samples and see how embossing and debossing can be excellent choices for your brand.